Company events are widely considered one of the best ways to grow your brand and provide useful information to attendees directly. When a business is hosting an event or training course, the typical run-of-the-mill presentations and paper evaluations can get very dull very quickly. What can you do to fix that problem? Well thankfully, for all of us, we have technology. Take the iPad for example. The tablet that made tablets practical, essentially. So how are you going to use this tablet technology to further your brand and help with attendee engagement? Just know that whether it be on the event floor or during the presentation, an iPad can really help bolster your event. Think about how much paper you may use during the entirety of your event. The copier would be on overload. Instead, why not go a bit greener by using an iPad to take care of things such as speaker and presentation evaluations. Paper signups and registration can get a bit hectic at times as well, depending on the type of event you may be hosting. By putting these types of forms directly onto the iPad your company has provided, you can save paper and keep everything much more organized in the long run. When your company hosts an event, you want to be as engaged with your attendees as possible. Communication is key in these types of situations. Everyone in the event industry can tell you about live tweeting during a presentation, and that’s just one of the ways an iPad can help. Hashtags aren’t just limited to Twitter anymore. We are now able to use hashtags on all major social media formats, thus making for a much more accessible conversation outlet. Whether it be a forum for attendees to talk about the event on, or if you’re using a hashtag to compose a poll or live tweeting question and answer session, the iPad can help you greatly. Most attendees will respond to something more visual rather than something they have to read. A picture is worth a thousand words after all. Your attendees will be able to talk to loved ones back home with Skype coming standard on almost all iPads now. With incredible camera quality and processing power, the iPad will be able to display crystal clear pictures and the cameras do their jobs very well. Not only will the attendees’ video chats go well (depending on the internet strength), but they will also be able to take gorgeous pictures that can more easily be posted directly to social media and other sites. Anyone who may be a bit more into photography than others will be able to transfer their pictures taken on a phone, and send them directly to the iPad. The use of an iPad during the presentation can be beneficial to attendees as well. We all know that nosebleed seats can make it hard for us to see. By having the iPad out during the presentation, you’re able to have the slide show play directly on the iPad through a master iPad controlling it. This way, those sitting in the back won’t have to strain their eyes, nor will they have to try to follow along as it will already be done for them. Think of this as well. Many more attendees will respond to an interactive presentation rather than watch another guy fiddle around with the same hand motion for 2 hours while he speaks. When you bring the iPad into the play during the speakers presentation, he may become more engaged with the audience and vice versa. Attendees will be more interested especially if the presentation is being played through their respective iPads as well. There is a multitude of different ways to help make your brand and/or company grow. One of the best and easiest ways to make that happen is at an event. With iPads, or any tablet for that matter, at your next event helping to make it a success, you can be sure that your brand and your audience will grow. 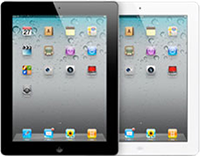 Try utilizing iPads at your next business event and see the difference for yourself!